The thymus gland helps immune cell growth. It is usually active when you are an infant, but its function reduces as you get older. 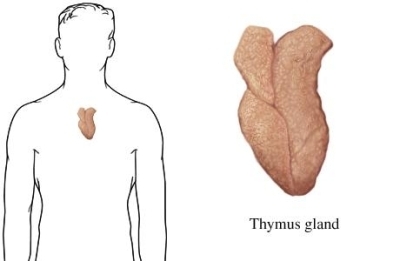 The thymus acts abnormally when a person has a condition calledmyasthenia gravis. A thymectomy is used to treat myasthenia gravis. Video-assisted thoracic surgery (VATS) or robot-assisted thoracic procedures—This is a less invasive option. Several tiny incisions are made in the area. A tiny camera will be inserted through one of the incisions. The camera will send images to a monitor in the room. Robotic arms may be used to do the surgery. Special tools will be passed through the remaining incisions to remove the thymus. After the thymus is removed, the incisions will be closed with stitches. General information about thymoma and thymic cancers. National Cancer Institute. Available at: http://www.cancer.gov/types/thymoma/patient/thymoma-treatment-pdq. Updated November 9, 2017. Accessed March 6, 2018. Myasthenia gravis fact sheet. National Institute of Neurological Disorders and Stroke website. Available at: http://www.ninds.nih.gov/disorders/myasthenia%5Fgravis/detail%5Fmyasthenia%5Fgravis.htm#84053153. Updated May 9, 2017. Accessed March 6, 2018.